Inkscape can be used to produce photo-realistic drawings. Inkscape features that are useful for this include: Gradienti, the Sfocatura Gaussiana filter, and Bitmap Tracing. This tutorial uses all of these to produce a realistic drawing of an old seltzer bottle. The source photograph is available on the book's website. 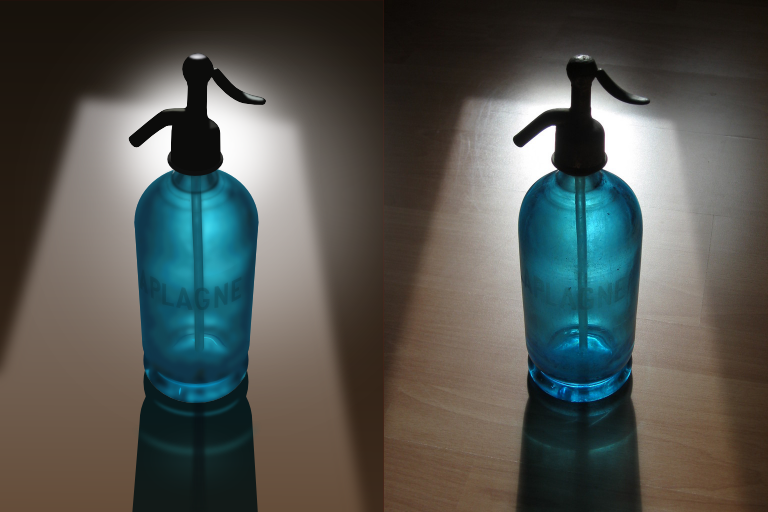 Our goal is to capture the essence of an antique bottle, not to copy all the fine detail (use a photograph for that). The hand-blown glass is irregular, something that would be hard to reproduce by hand drawing, even with gradients and blurring. To simulate the glass, we'll use the auto-tracing routines built into Inkscape. Tracing has its flaws, though, which we'll need to work around. The handle and background, on the other hand, are prime candidates for Gradienti and Blurs. The full tutorial can be found in the PDF version of the book. For more information, check the book's web site.